« Why are My Patio Pavers Loose? Outdoor lighting adds style and safety! Now that spring has arrived, you’re probably spending more time outside, enjoying the weather with family and friends. You don’t want darkness to be the reason that your good time has to end. That’s just one of the many reasons why you should update your lighting for spring. It’s the perfect time of year for outdoor work on your home, and you’ll be able to see just how much your lighting updates have improved the function and beauty of your home. Before you get started on your outdoor lighting update, you should conduct a lighting audit of what you already have in place. Think about the way you currently use your outdoor space and any plans or changes you’d like to add to its function. Will it be used for entertaining or do you want to use your lighting to highlight your garden? Is it just for security purposes or would you like to highlight the unique architecture of your home? In addition to these questions, check to make sure that your current lighting fixtures are sufficient for space and whether they cast enough light for your driveway and entertainment areas. Whatever the case, it’s helpful to know what you have in place and how you want your new lighting features to function. 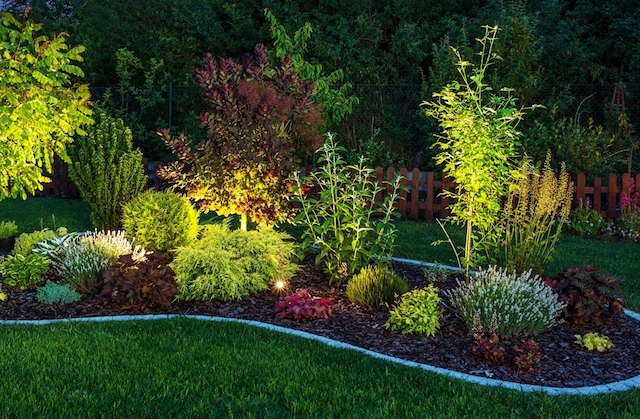 Efficient landscape lighting can supplement your overall outdoor lighting. Also, you can add enhanced visual appeal with interesting effects and colors. Consider installing lighting fixtures that are saltwater-rated as they usually come with lifetime finish warranties. Furthermore, salt-water-rated fixtures are especially beneficial if you live within 20 miles of the ocean. With the spring comes warmer weather. With that said, you may want to consider adding a fan to your ceiling light fixture. With summer just around the corner, you’ll appreciate the added comfort that ceiling fans bring to your space. These aren’t just for interior use, but ceiling fans are also great additions to enclosed outdoor patios and porches. An added benefit to ceiling fans are the energy savings associated with running your fans rather than having to turn on your air conditioner. Atlantic Maintenance Group is a full-service landscaping company, providing maintenance, design, and construction, as well as snow removal, asphalt, and concrete services. To get your free quote today, give us a call at 410-768-4720 or contact us via our website today. You can also follow us on Facebook, Twitter, Pinterest, and Google+ to see how we’re growing! This entry was posted on Friday, May 25th, 2018	at 6:01 pm	and is filed under Exterior Lighting	. You can follow any responses to this entry through the RSS 2.0	feed. Both comments and pings are currently closed.